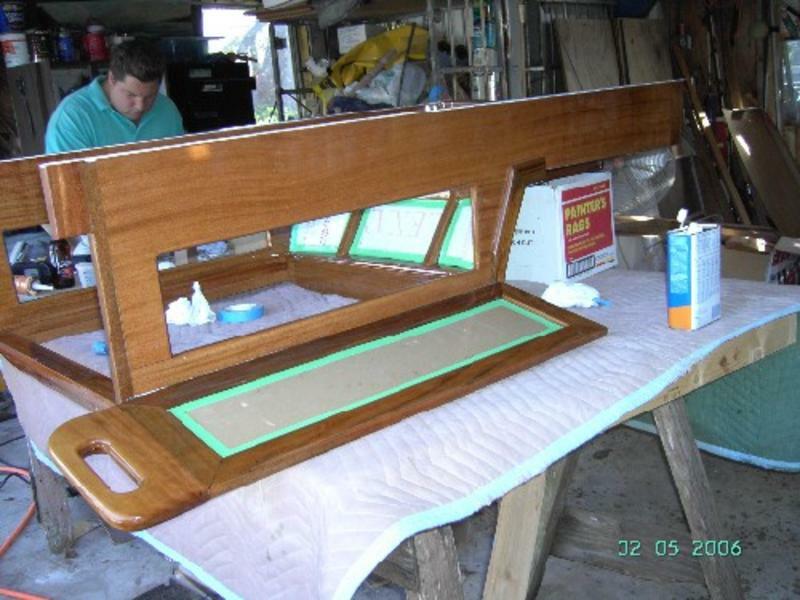 Custom solid teak rails and interior. 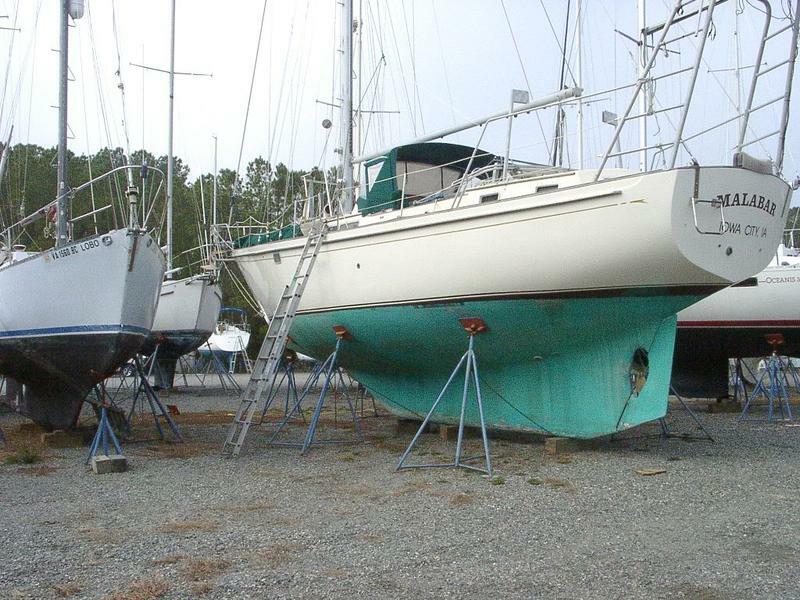 Full set of sails in great condition. 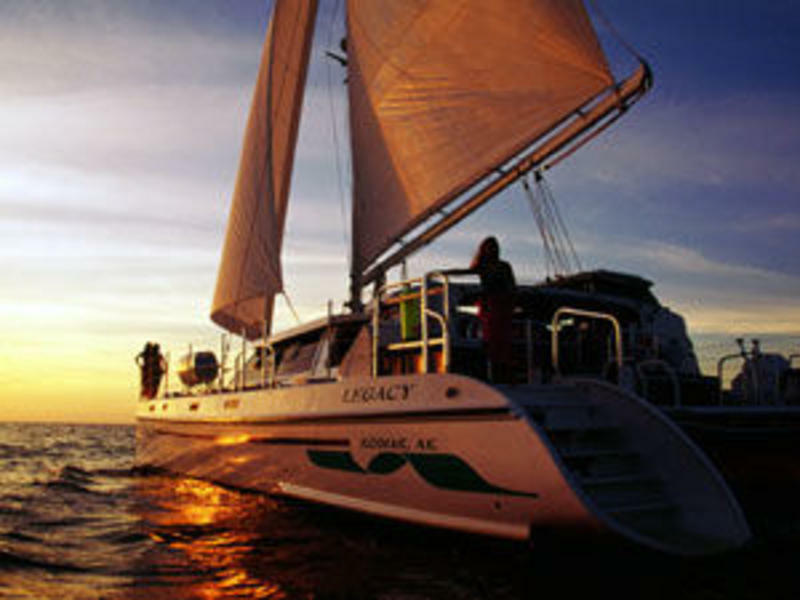 Evening Star is ready to be sailed away. 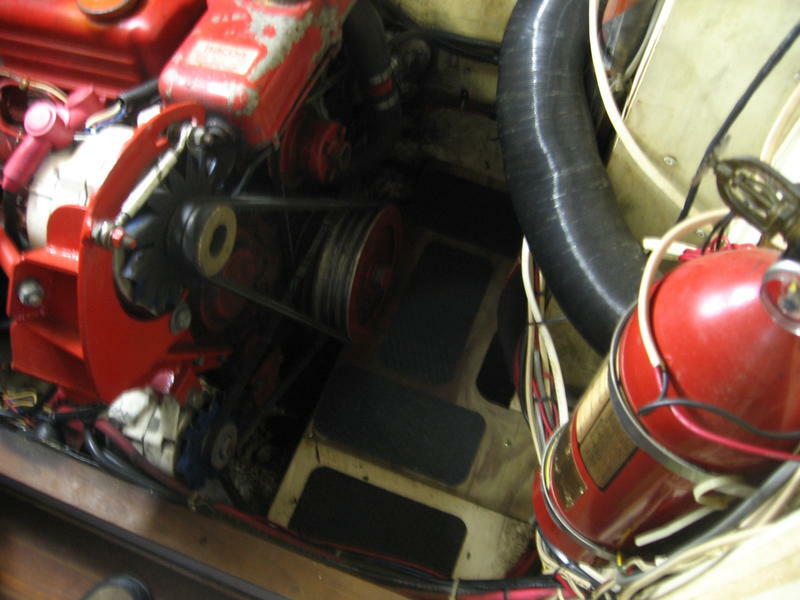 Yanmar 75 hp Model 4JH3-TE 2008 Turbo diesel 634 hrs. 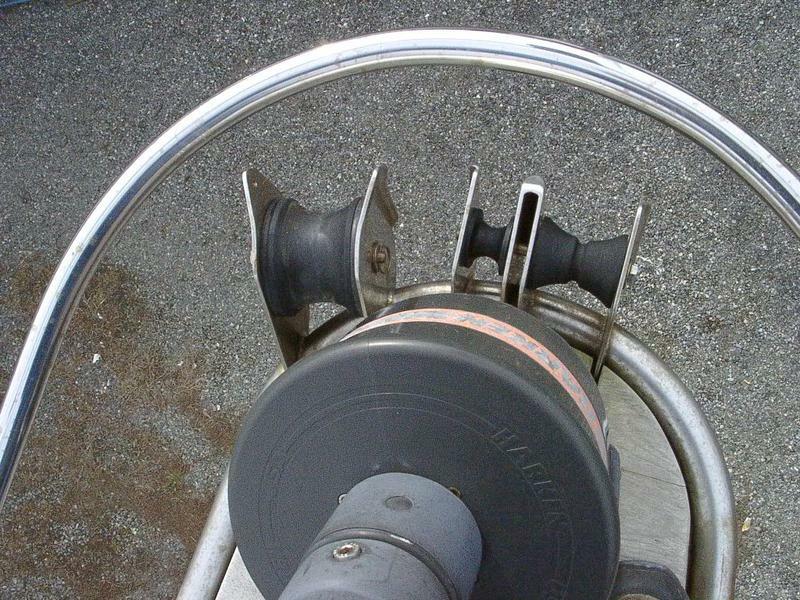 Steering Edson cable, wheel on binnacle in cockpit. 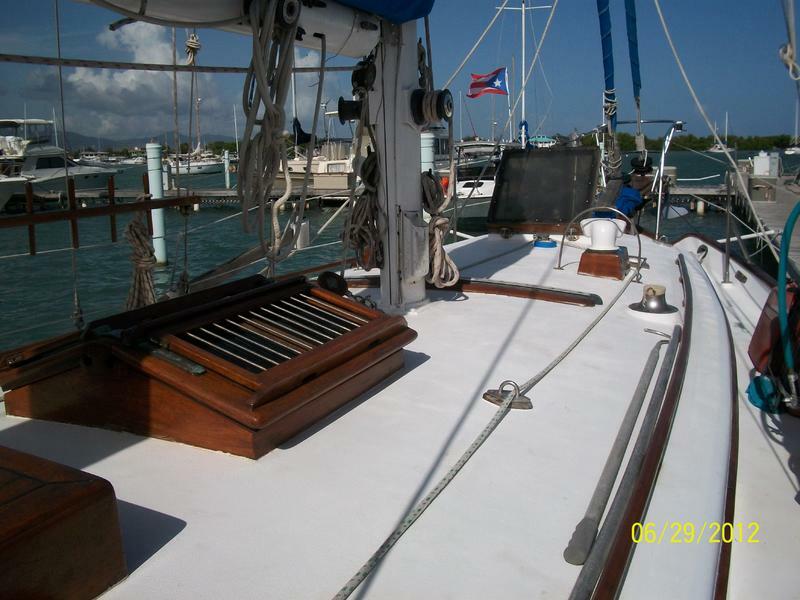 We ve lived aboard cruising the caribbean for the last 20 years…Time to move ashore. 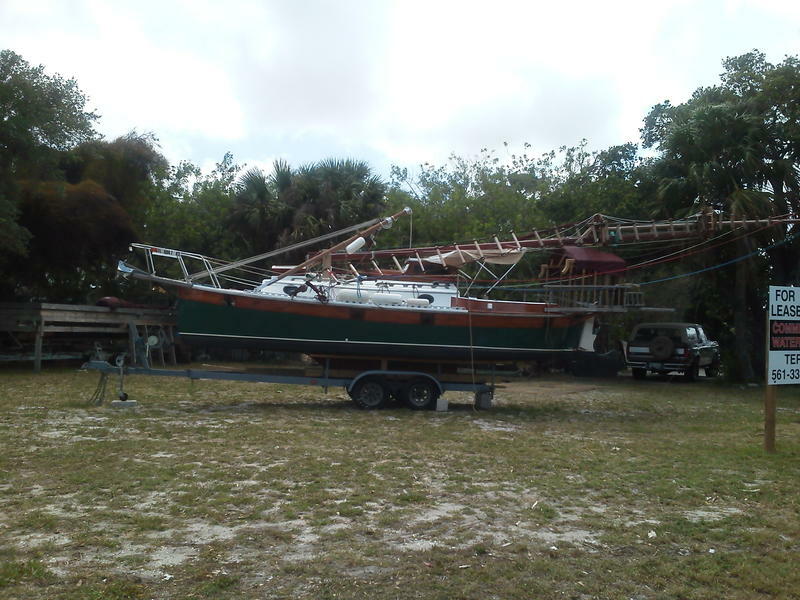 Excellent, one owner, well taken care boat. 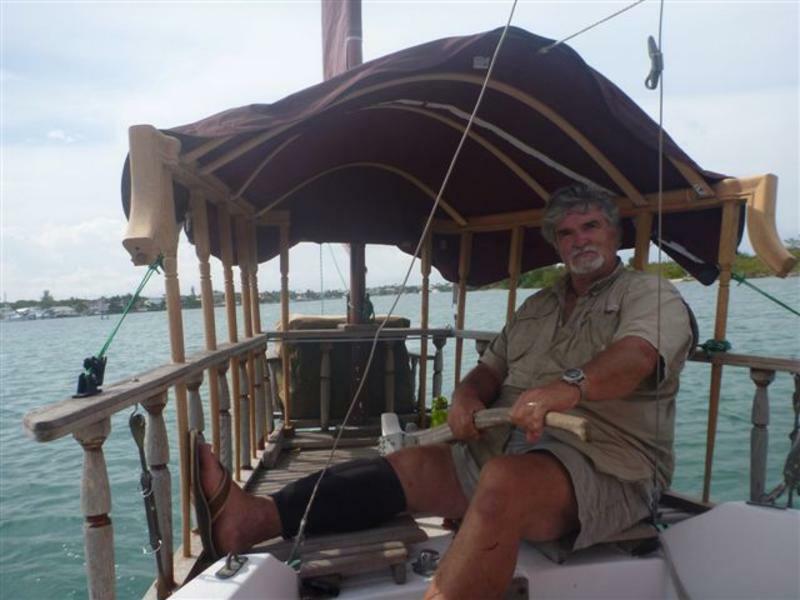 Well worth seeing. 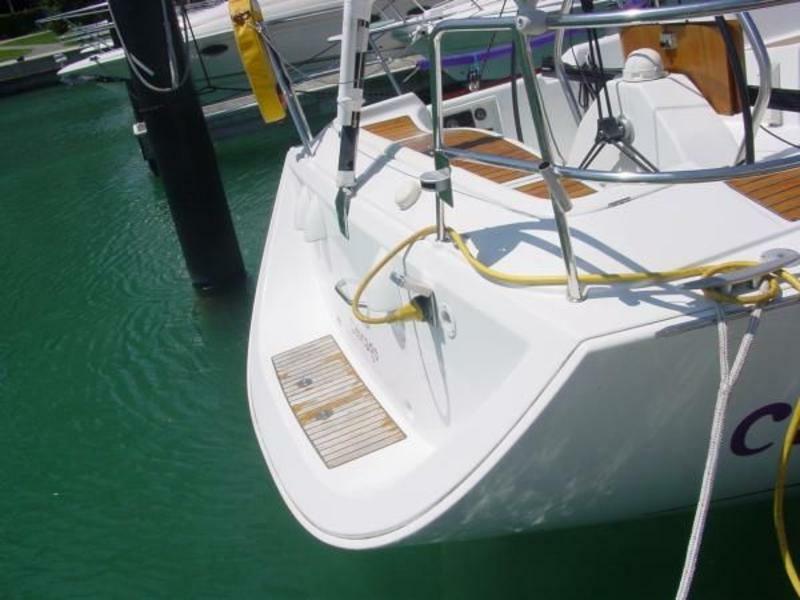 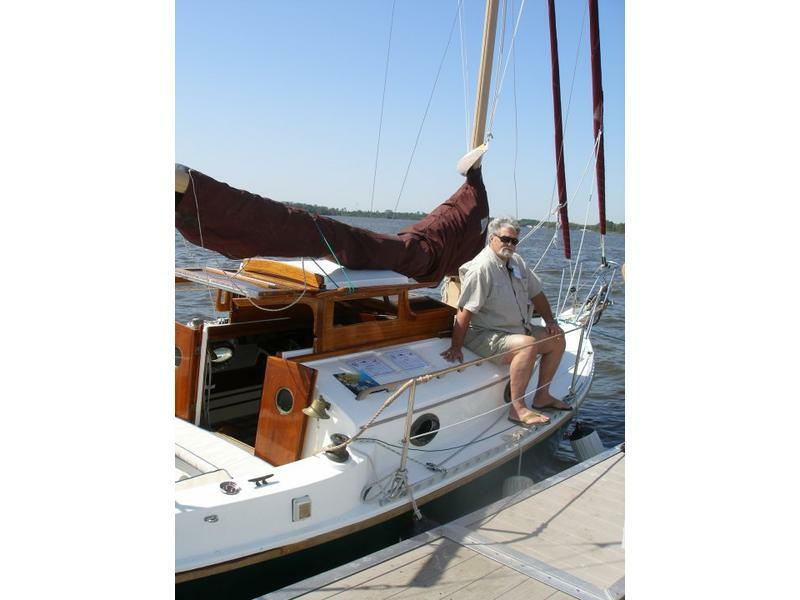 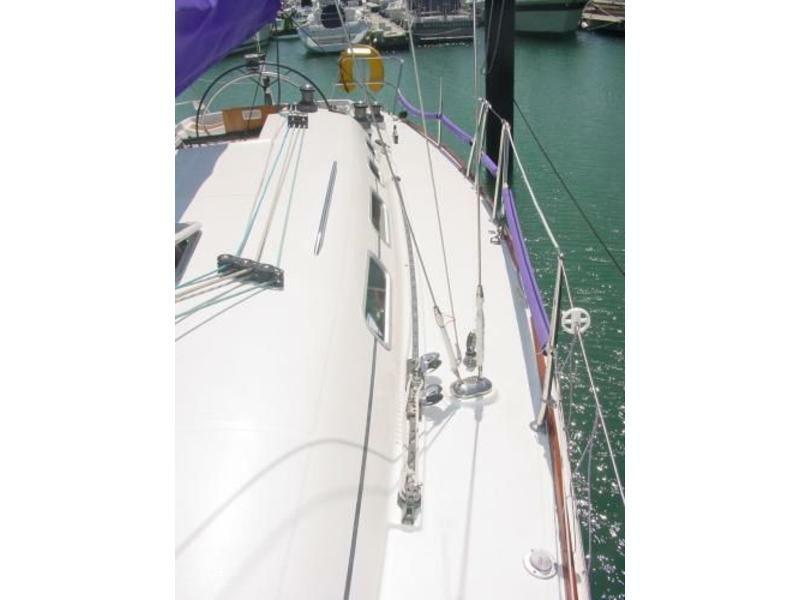 White hull, cutter rig, Doyle Stack Pack, great shape, fully batten main sail, very little use, 2 anchors, a CQR 45 lb. 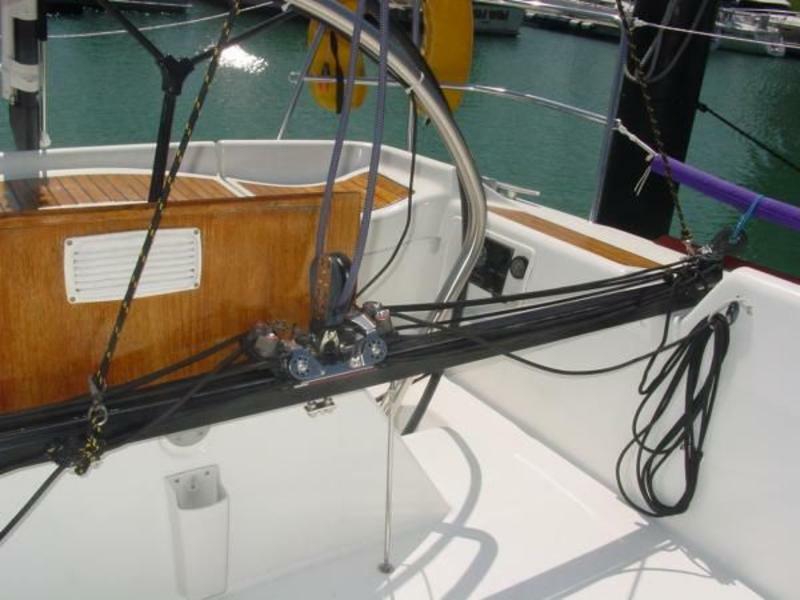 and a 75 CQR, 75 lbs., chain on the two anchors plus nylong rode. 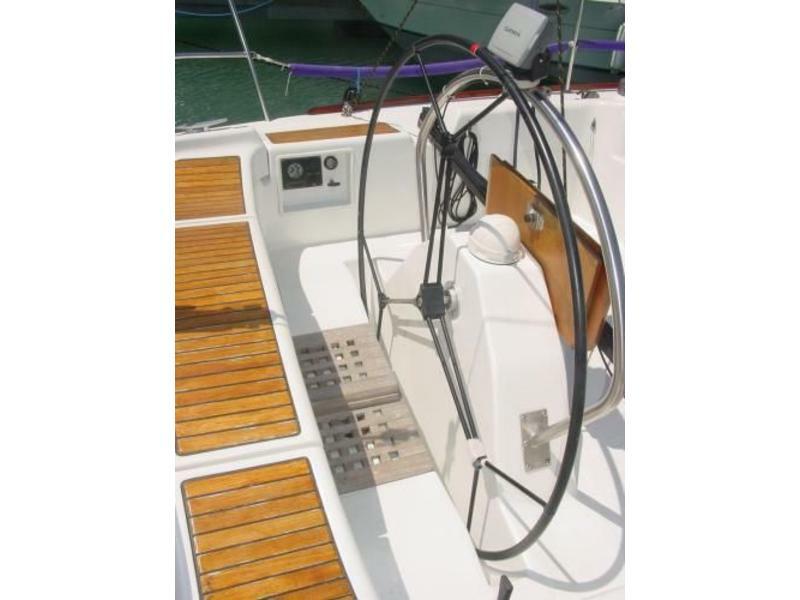 Lofrans electric windlass,Icom Ham Radio, Icom 735, Icom VHF Radio, Micrologic Explorer GPS, Sony FM, AM radio and tape player, TV and CD player, Tuner for the Ham Radio, roller furling on both head sails. 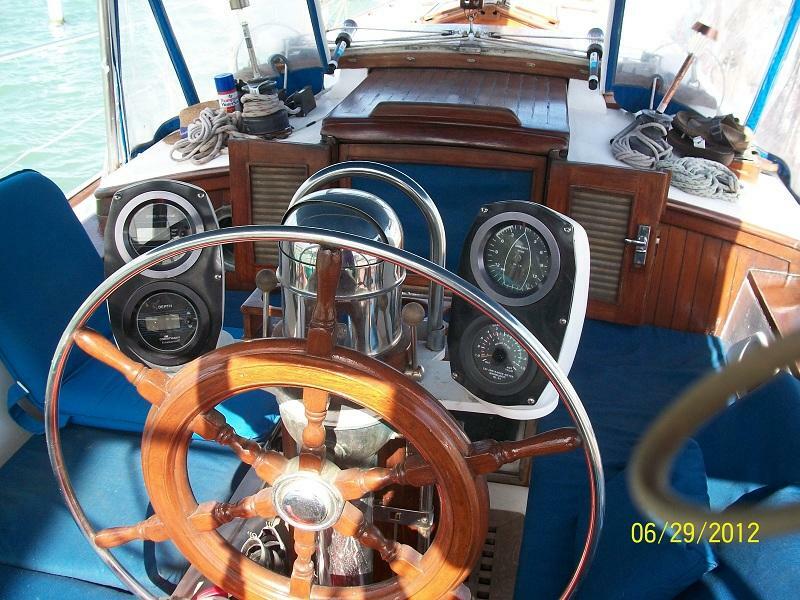 Depth finder, 6 fans, 2 in main cabin, 1 in Galley 1 over navigagtion desk, 1 in head and 1 in forward berth. 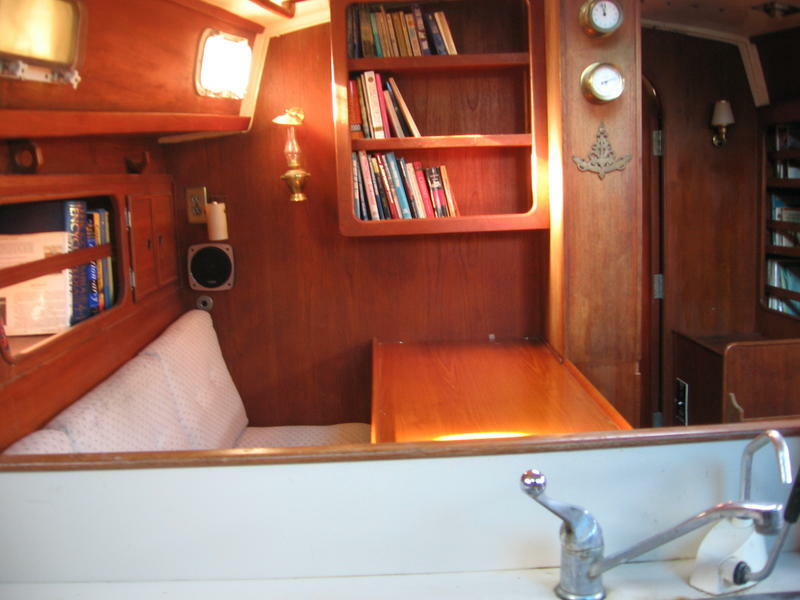 Bathrom forward, with separate full standing shower A Dickinson diesel cabin heater, brass barometer, 2 brass clocks plus a tide clock, 2 brass oil lamps. 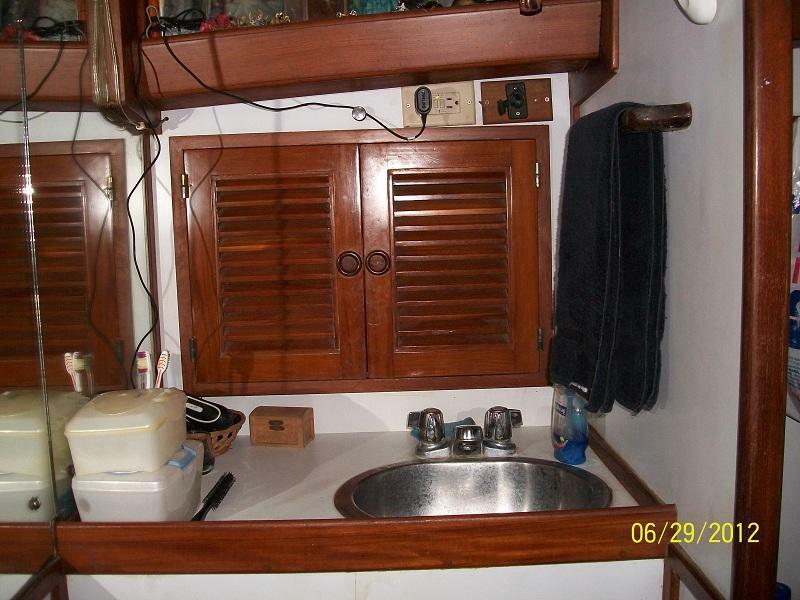 AC and DC outlets throughout boat. 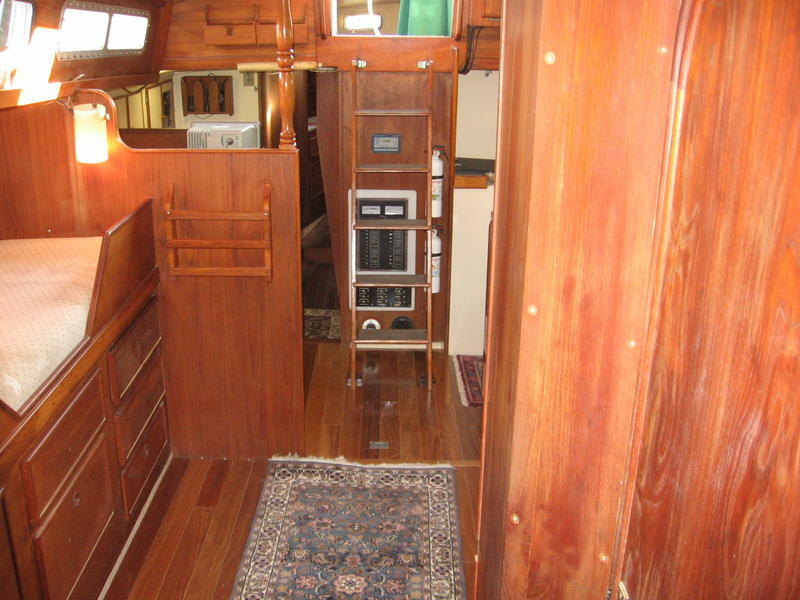 Galley with 3 burners,oven, solenoid propane system w 2 tanks stored aft. 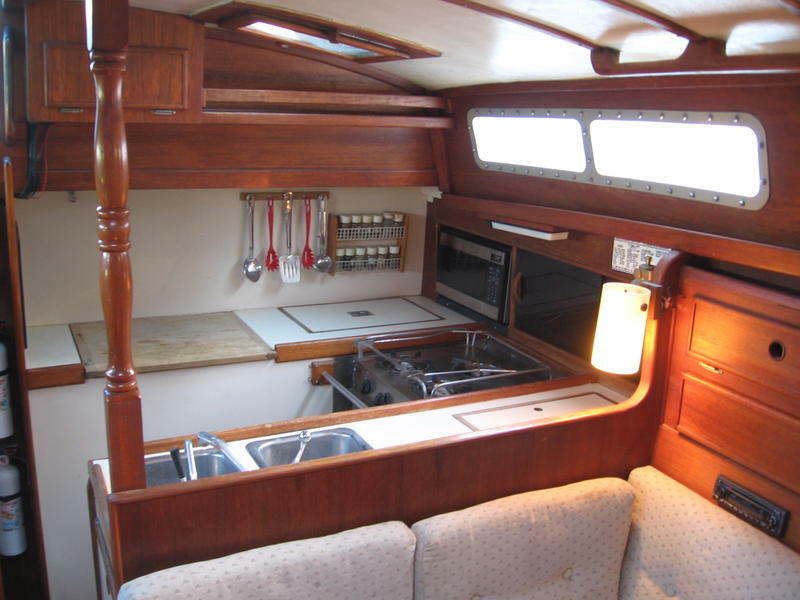 Front opening 12 V fridge, and freezer…beers are always cold! 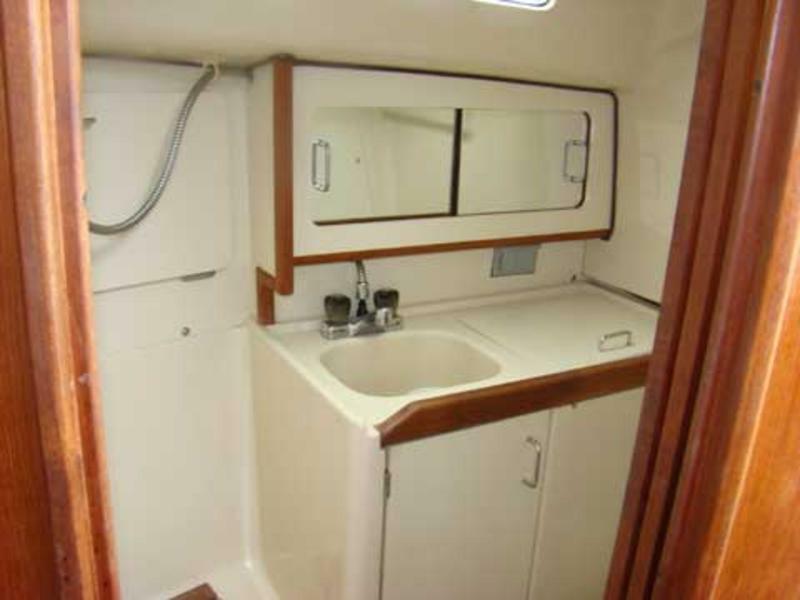 Microwave comes with the boat as well! 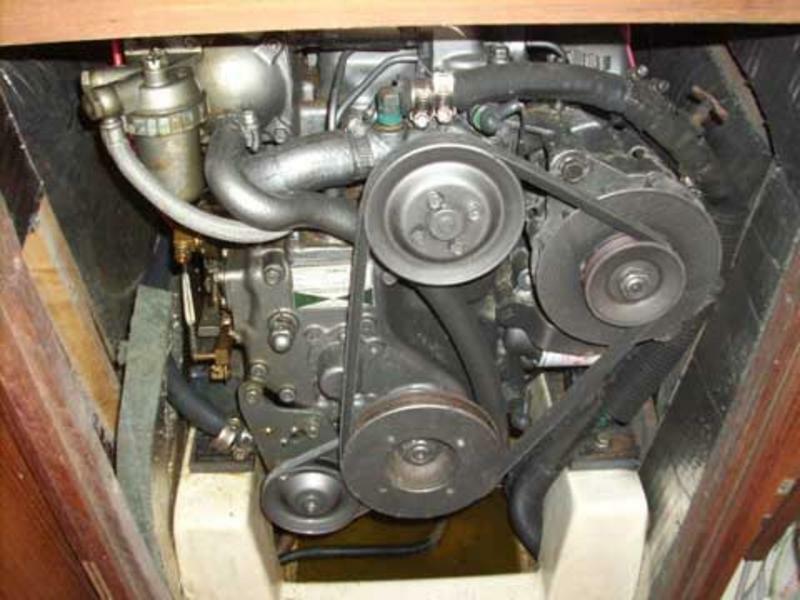 Outboard engine (Yamaha) very little hourslike maybe 10 total. 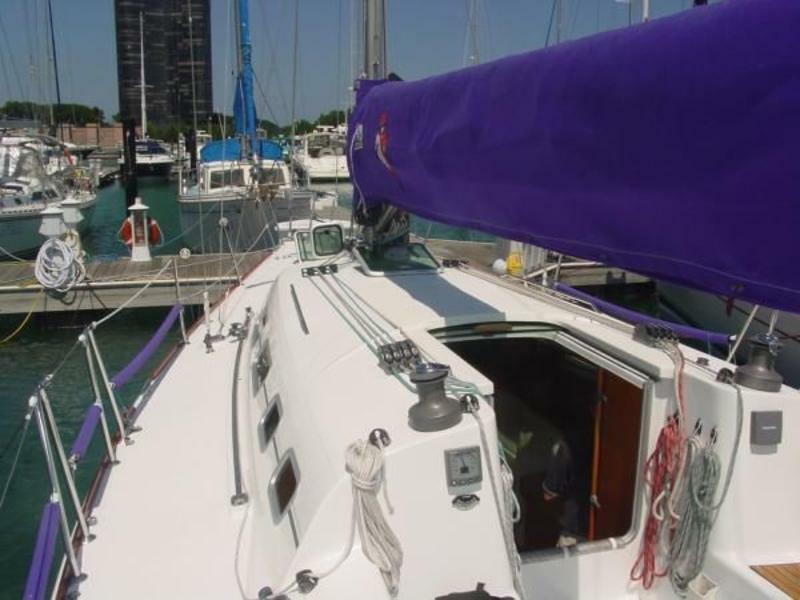 2 solar panels (150Watts) and wind generator installed on stainless steel overhead davits. 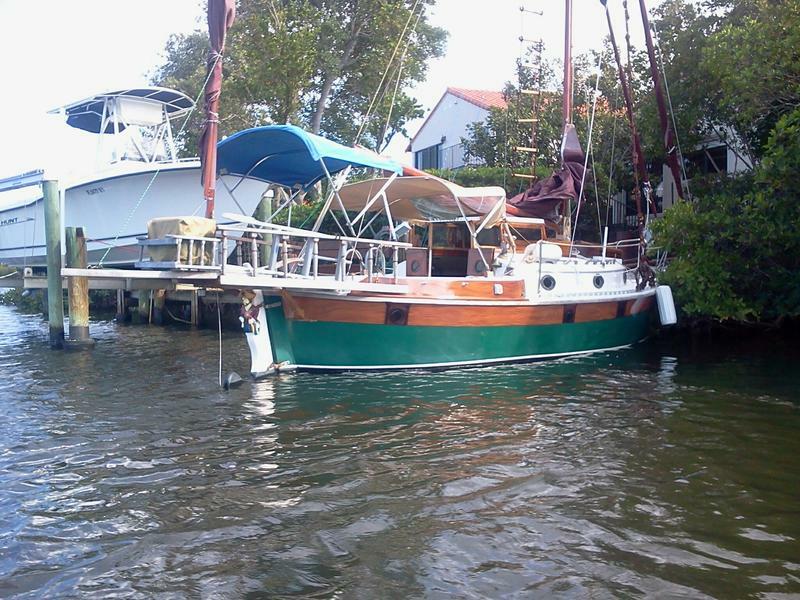 New transmission, engine is Yanmar 35Hp, runs great! 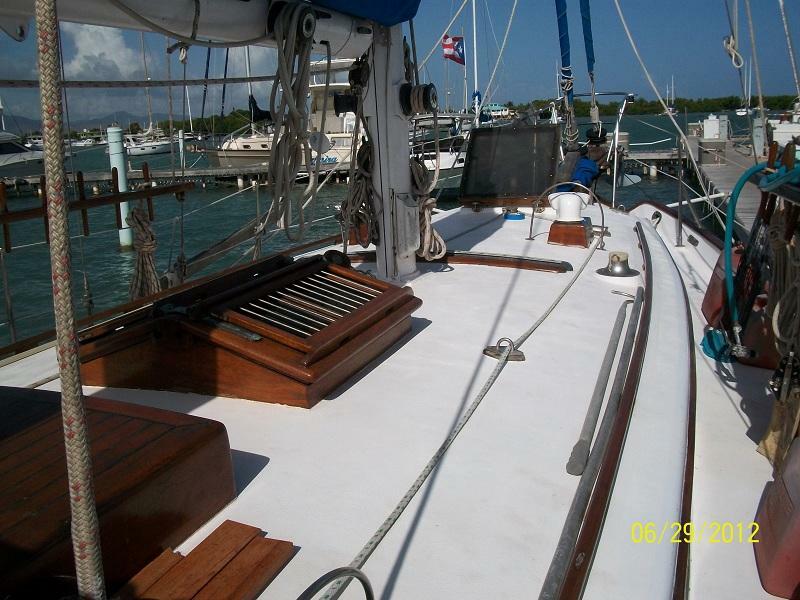 Much much more…make us an offer and you can be sailing next week…10 hours to the Spanish Virgin Islands!! 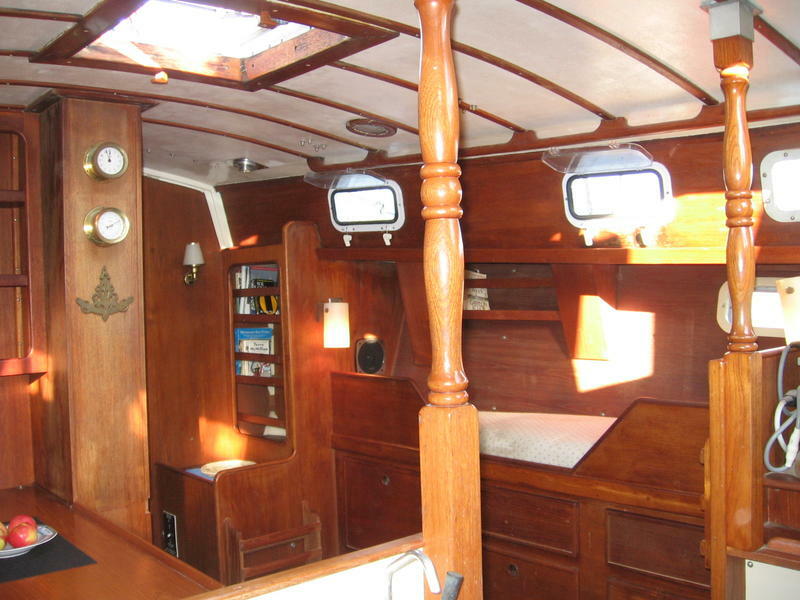 Whitby Boatworks built more than 250 Whitby 42 ketches and 2 Whitby 42 single masted cutters. 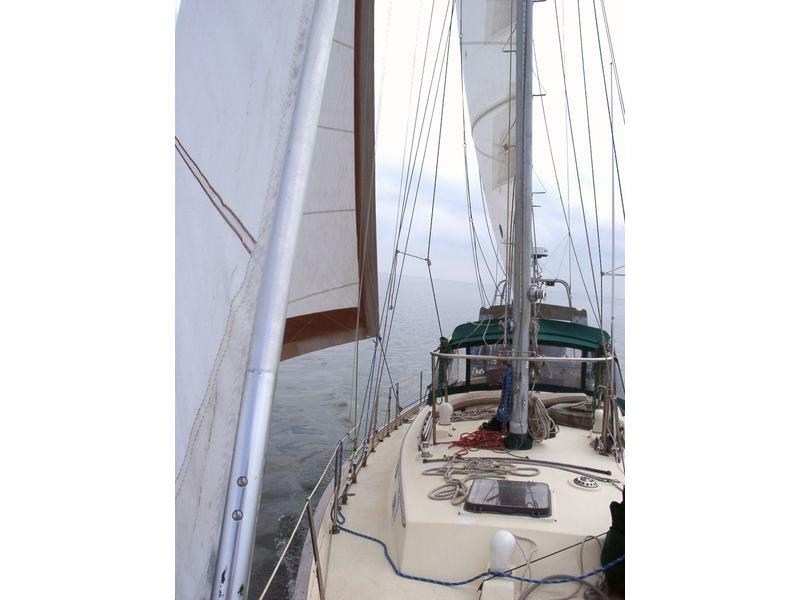 One of these sailed the Puget Sound for many years, regularly outsailing her ketch-rigged sisters. 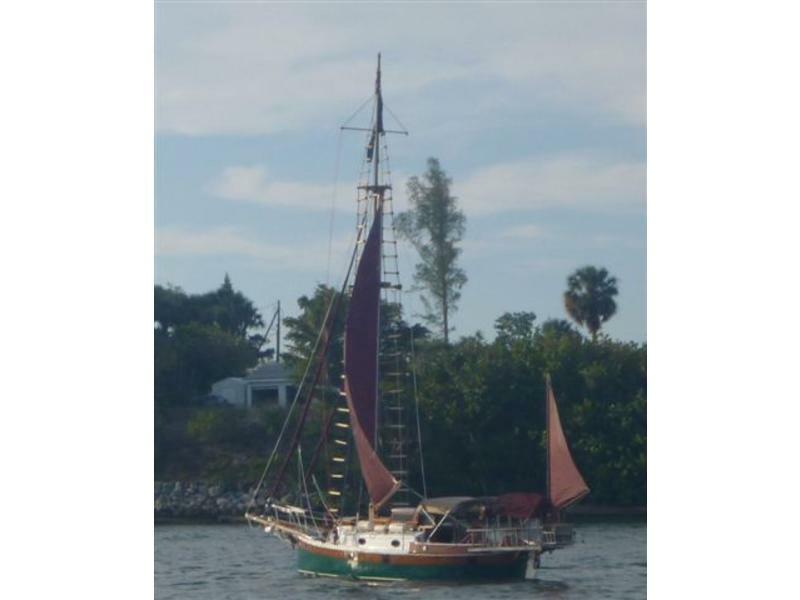 The other single-masted cutter is Malabar. 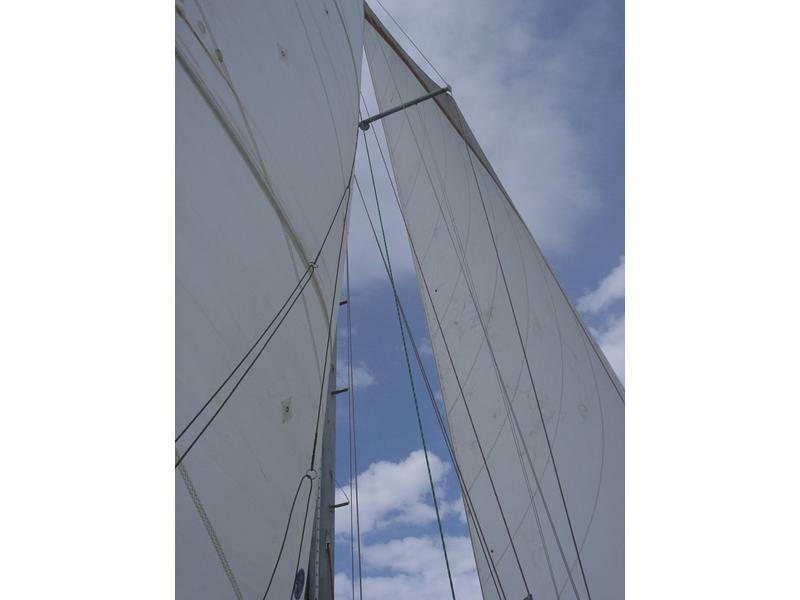 All Whitbys were built to order and when we contracted for Malabar in 1980, we insisted on a single-masted vessel because we wanted superior sailing qualities. 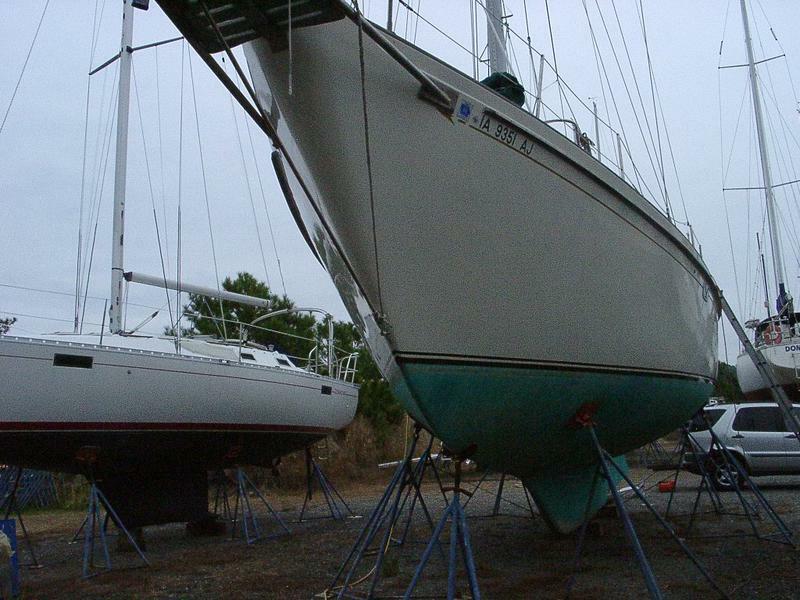 When Brewer designed the boat, slab reefing had yet to be widely accepted: people would drop the main and go “under jib and jigger.” Today, by retaining the slot effect between jib and reefed main (no mizzen), boat speed can be maintained more efficiently and with better course keeping. 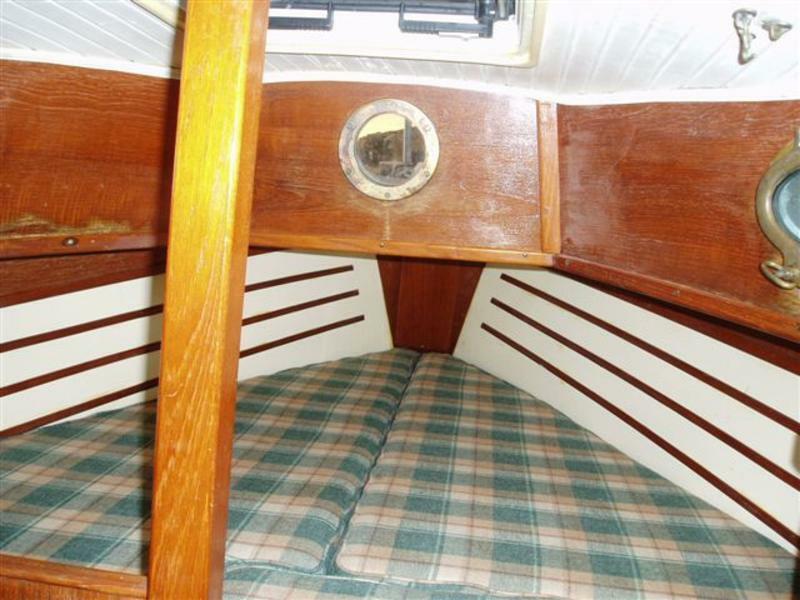 On the Whitby, there is no space between the main and the mizzen. 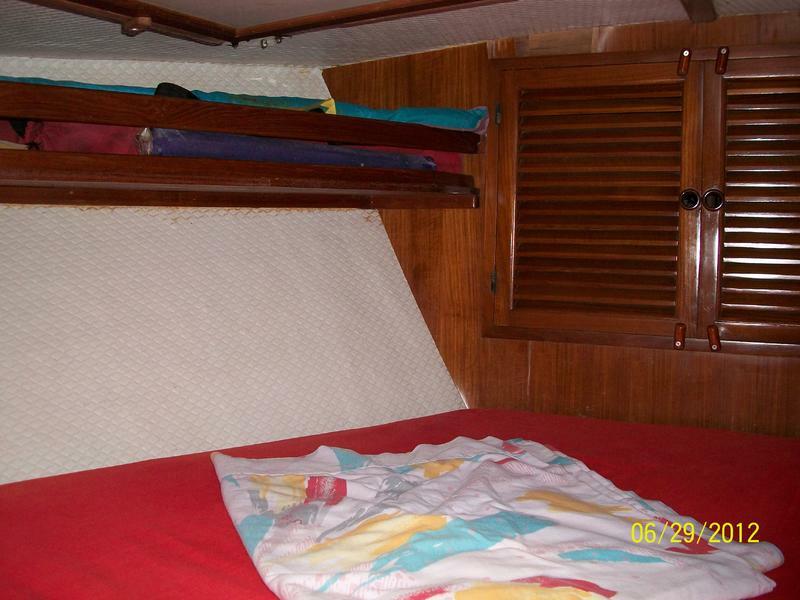 Consequently, the mizzen is blanketed by the main to windward and blankets the main downwind. 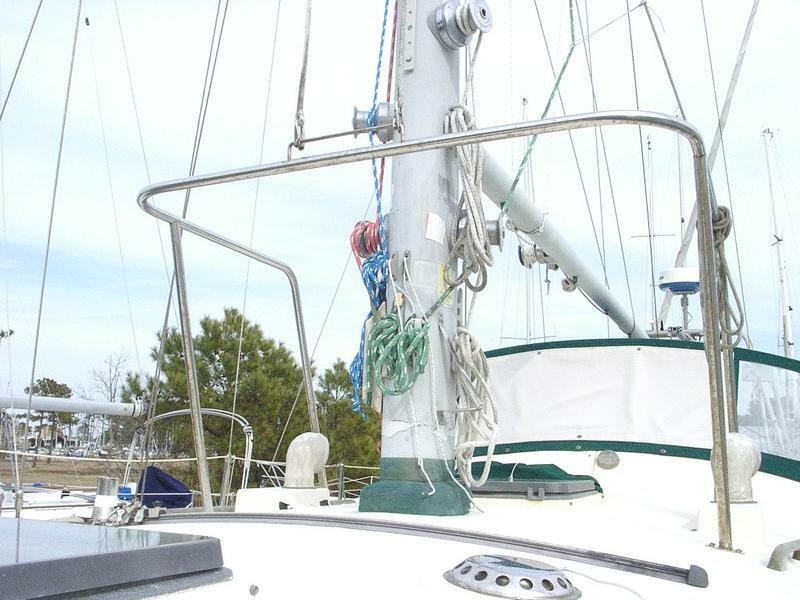 More significantly, because of its excessive size, the mizzen generates fierce weather helm (though not on a run). 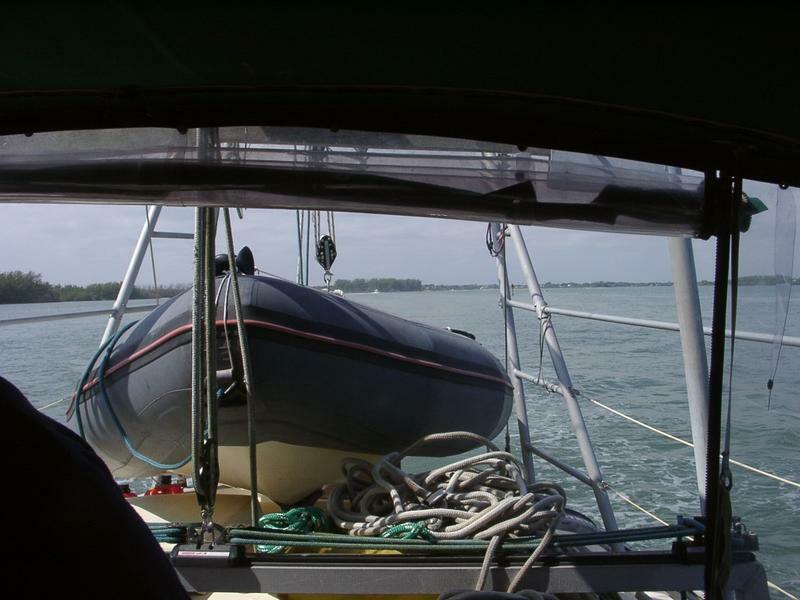 Dropping the main moves the CE forward slightly, but not enough to affect the weather helm. 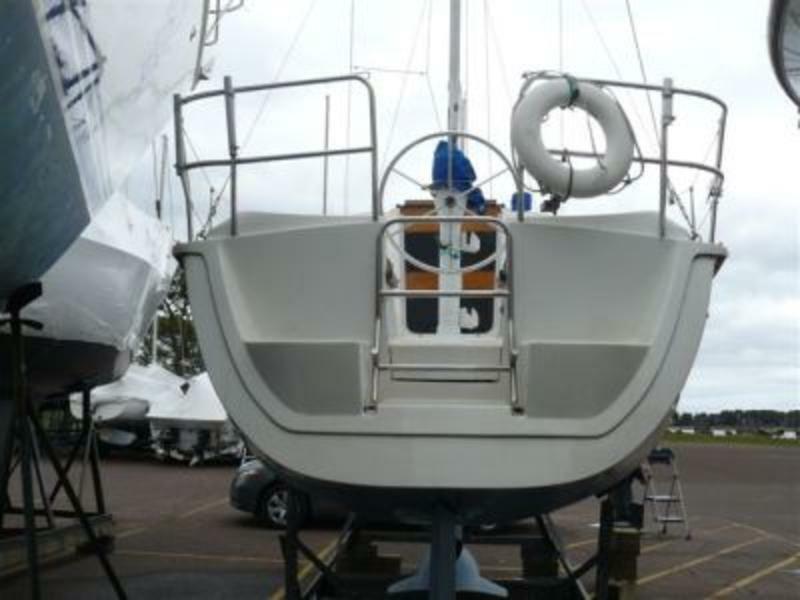 Most Whitby owners cope with weather helm by applying constant correction at the helm. 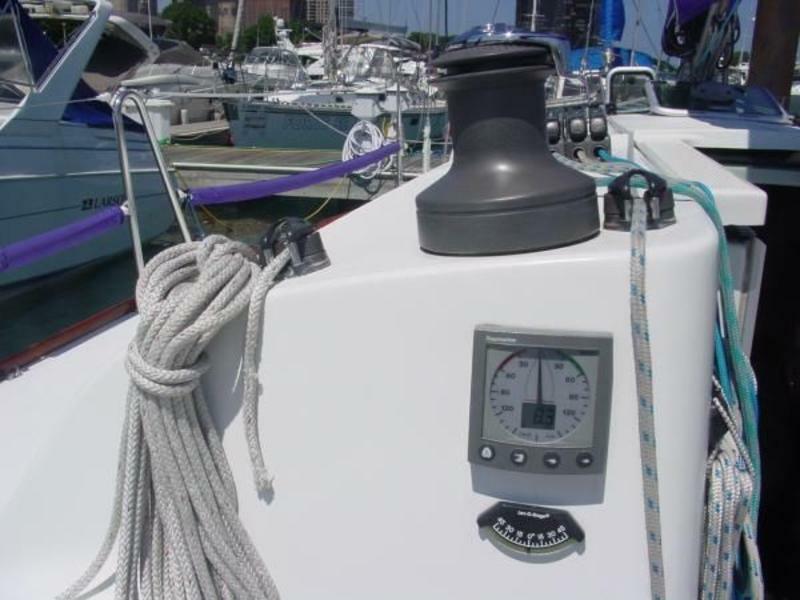 Lacking “feel,” the hydraulic steering does not transmit the weather helm to the helmsman, who is left to deplore instead what is incorrectly thought to be an inadequately sized rudder. 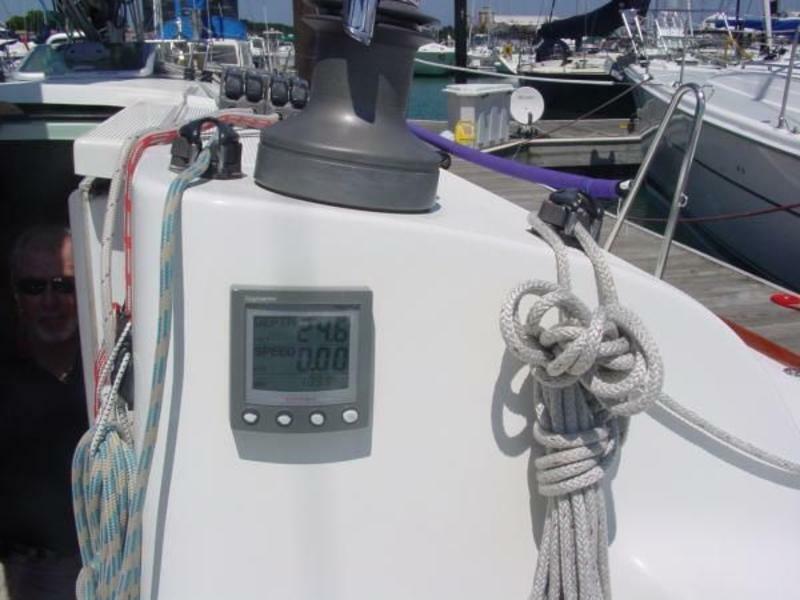 As a corollary, when the helm is entrusted to the autopilot, there is a significant increase in power usage. 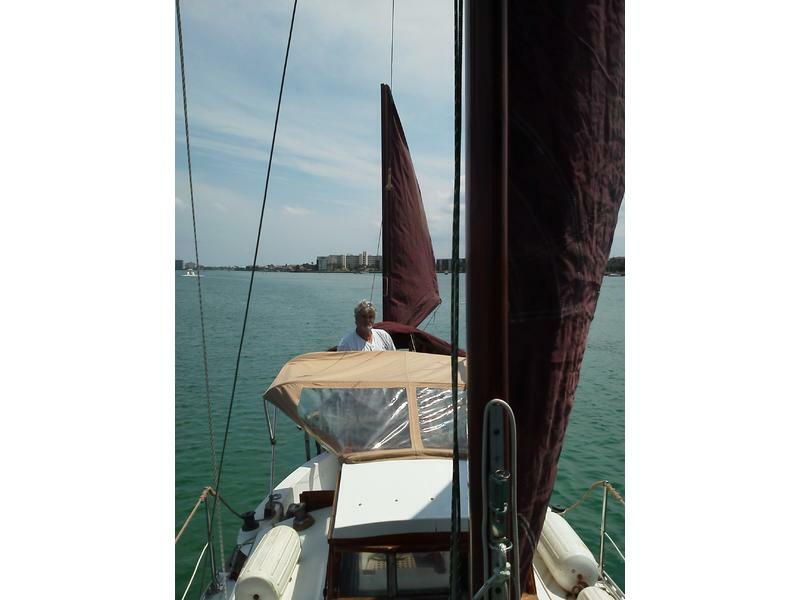 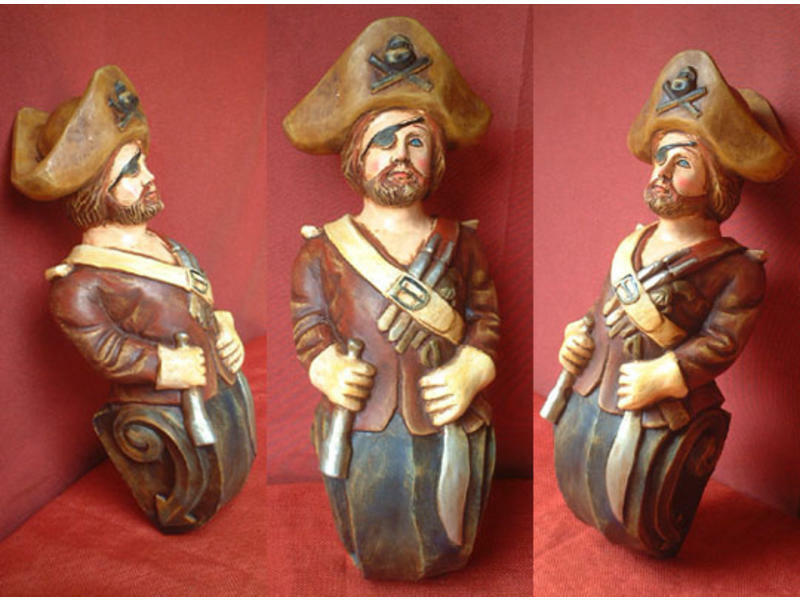 Some owners matter-of-factly state that they always sail “under jib and jigger! 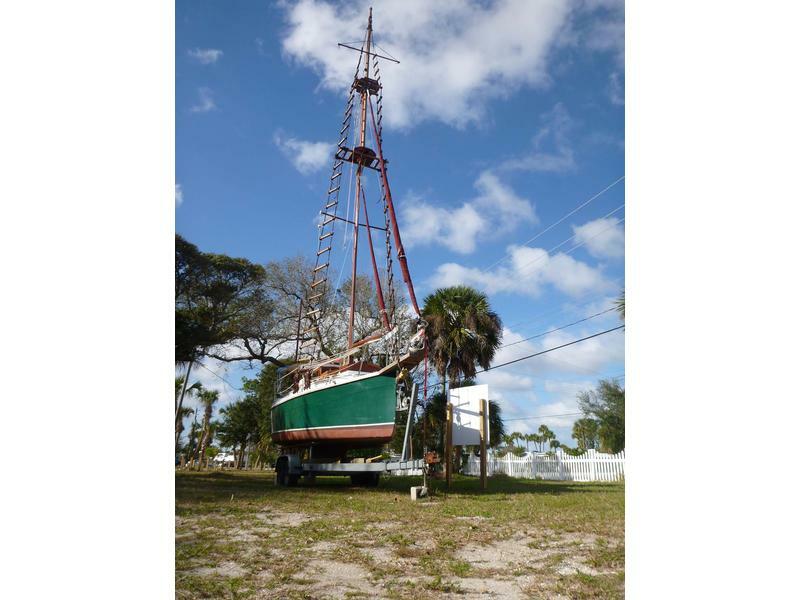 !” Owners who understand the role of the mizzen rarely hoist it–a couple of owners have actually had it removed . 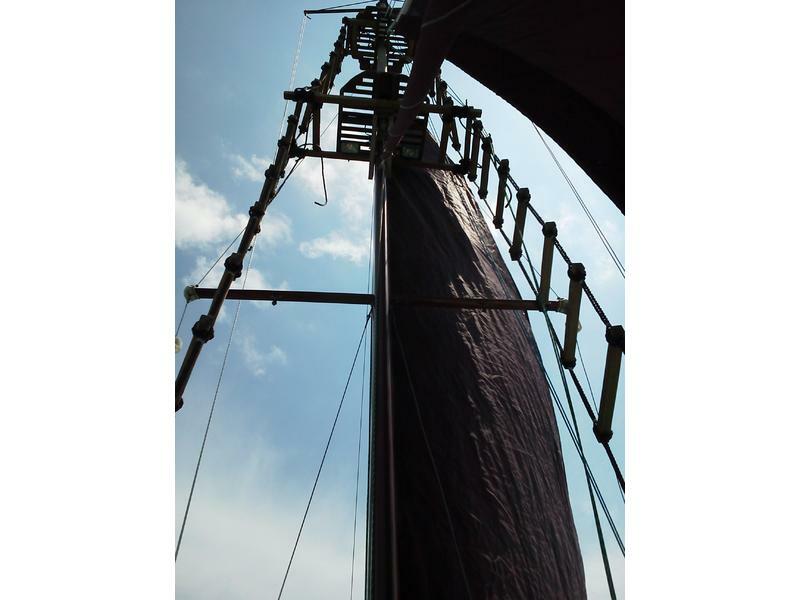 By ordering Malabar as a single-masted cutter, we eliminated the perfunctory mizzen, along with the windage, deck clutter of its standing rigging and, of course, the weather helm. 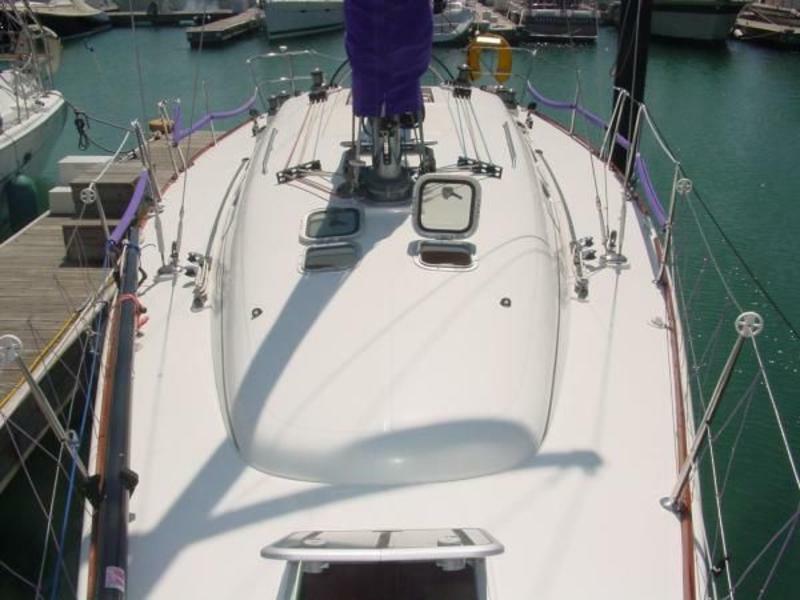 Instead, we obtained a larger, more efficient, more powerful main (without increasing mast height or raising the CE) and achieved our goal: a dramatically better performer. 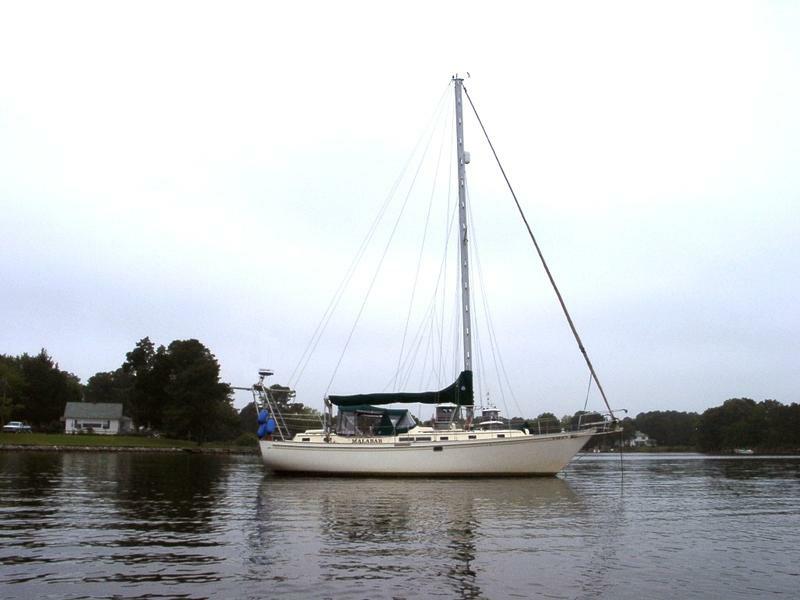 We sold Malabar in 1983 because the construction of an aluminum 53-footer which we had ordered from Kanter Yachts was nearing completion. 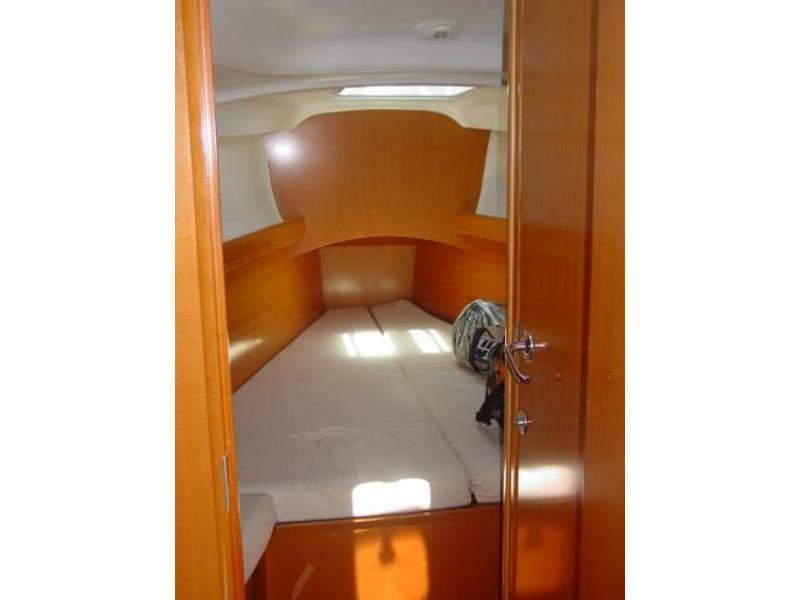 charging; salon table; salon size; no sea-berth; onboard heating. 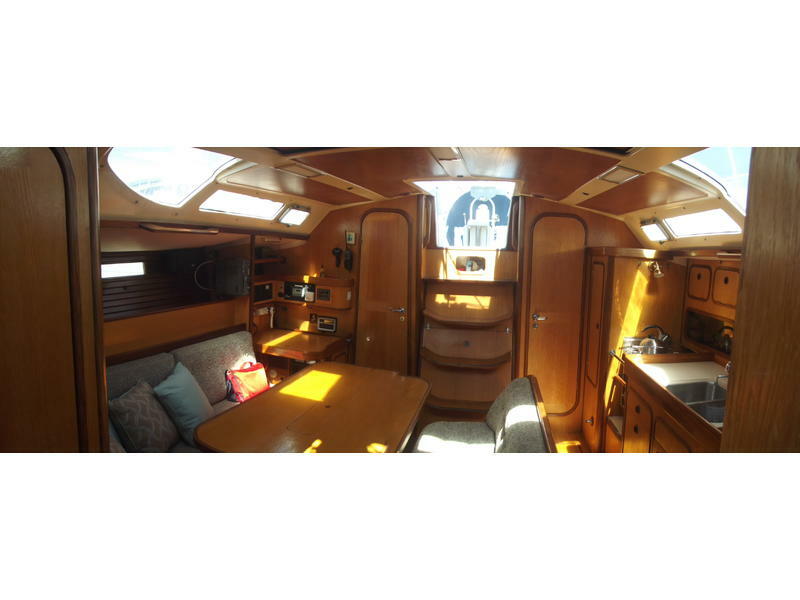 This is an ideal vessel for private ownership and cruising with guests or family – Her 4 cabin layout with private en-suite bathrooms affords the maximum privacy possible and her large berths and large cabins offer a great deal of comfort. 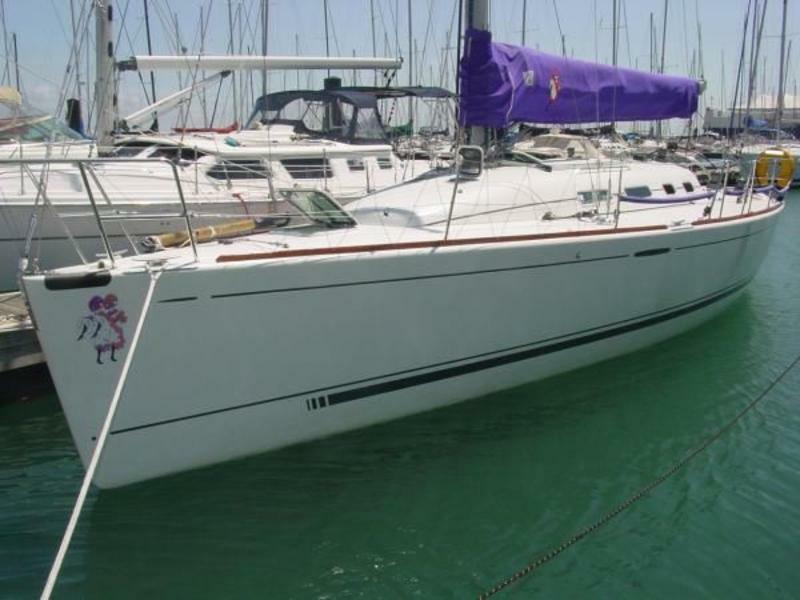 The seller will deliver this vessel to any location in the Med or either side of the Atlantic Ocean, with or without her new owner, upon the completion of a purchase. 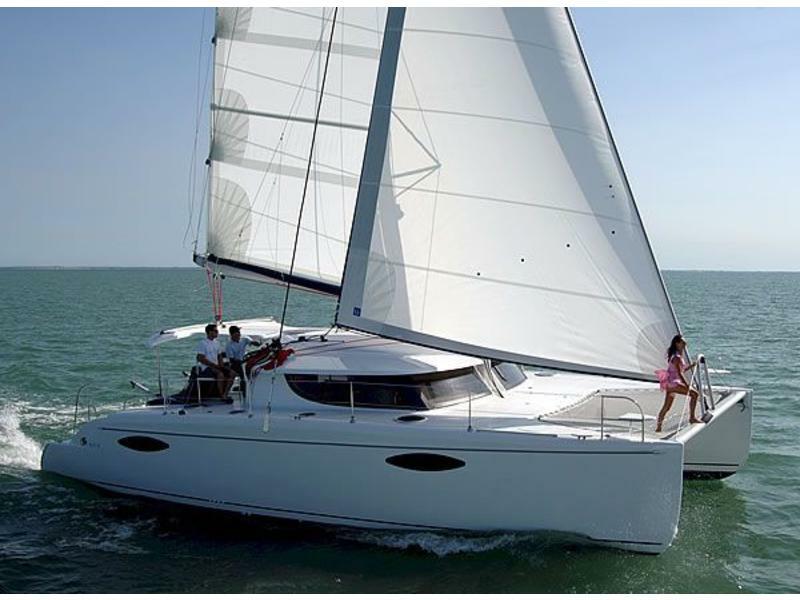 This is a 65 foot custom sailing catamaran with more than enough room  specifically designed to deliver a stable, comfortable, and environmentally friendly ride to help you make the most of your cruising or live-a-board experience. 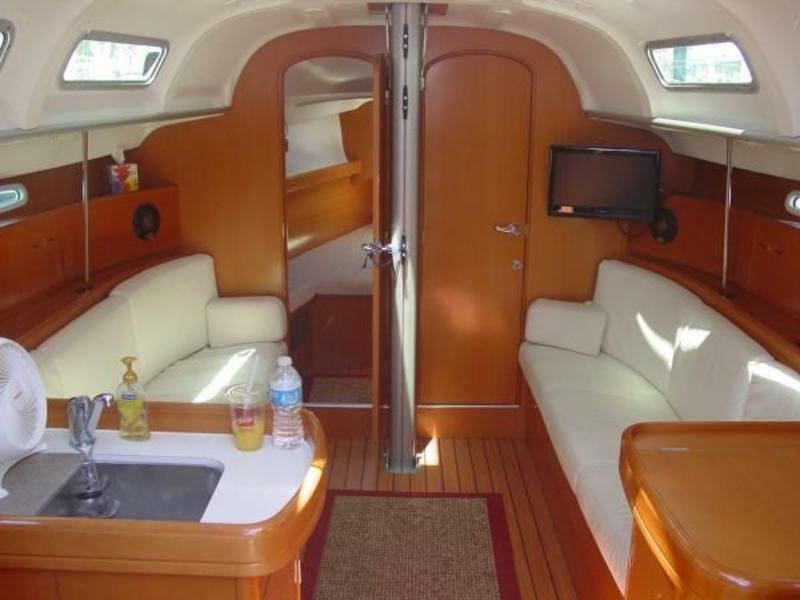 She has acres of deck space – Indoor and Outdoor dining facilities – Fully air conditioned interiors – and all the extras for the discriminating owner – or charter operation. 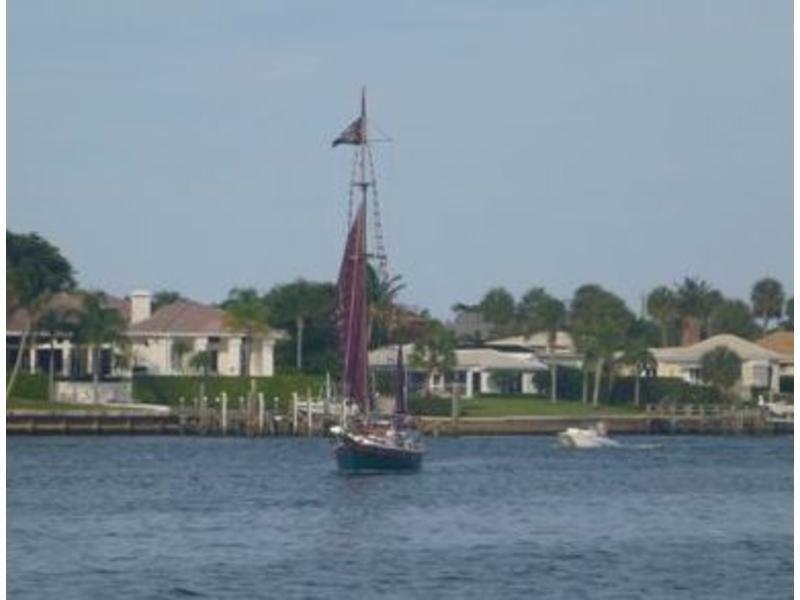 This is a true Pirate Vessel! 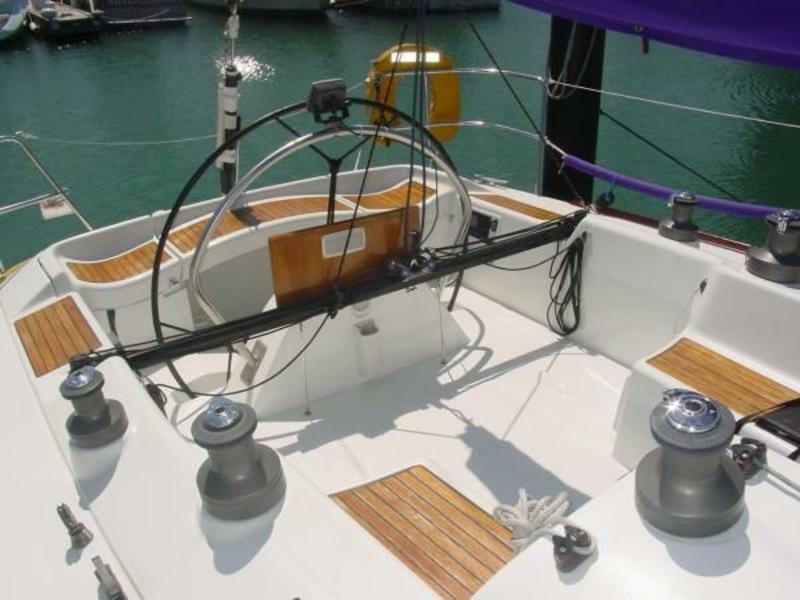 This 2004 racer/cruiser that is race ready with one-design class upgrades including Harken windward sheeting, Harken spin track, carbon spin pole, pedestal handrail, LED navigation lights and a full racing sail inventory. 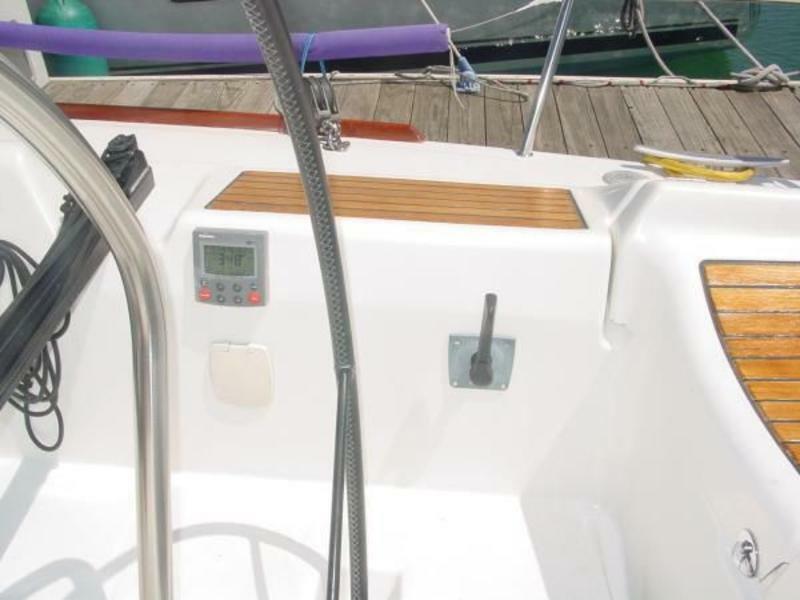 Even with the speed of a racer, this Beneteau First 40.7 is not shy on luxury. 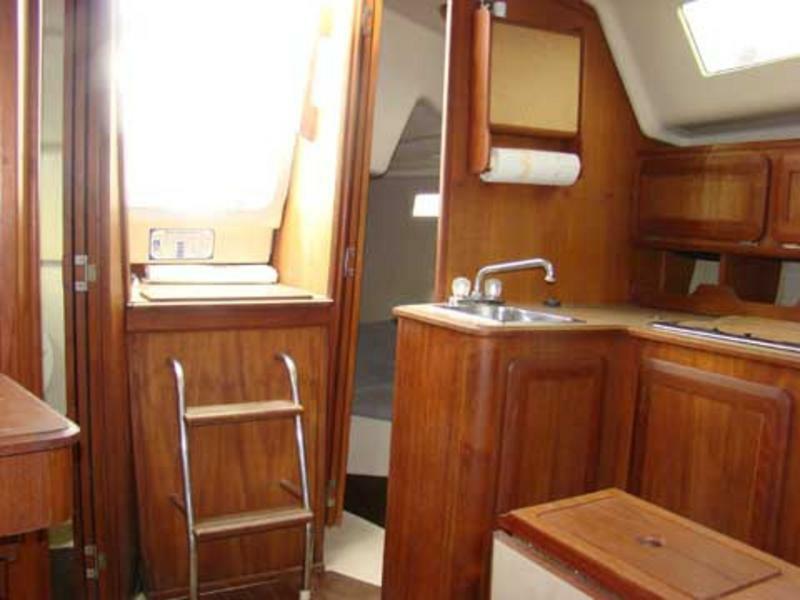 The cockpit is spacious with removable seat lockers. 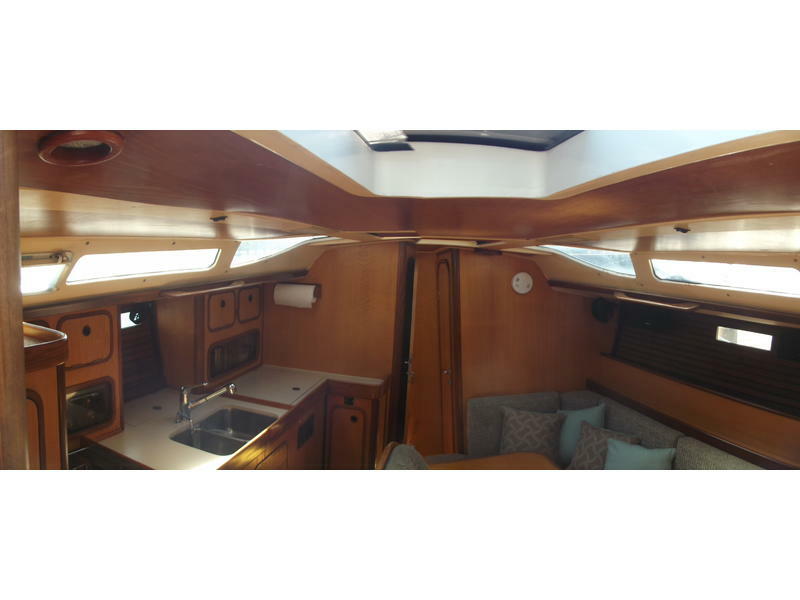 The salon is nicely appointed with 6 5 headroom, 3 double cabins, salon seating for 8, L-shaped galley, head with shower, Halogen reading lamps and overhead lighting throughout, and flat panel TV with DVD player. 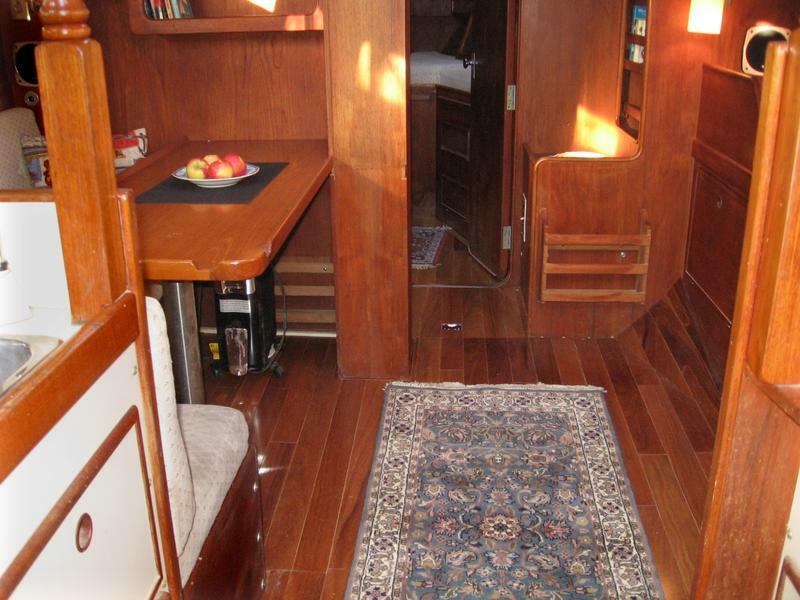 The light pearwood finished cabinetry provides a warm and airy feeling. 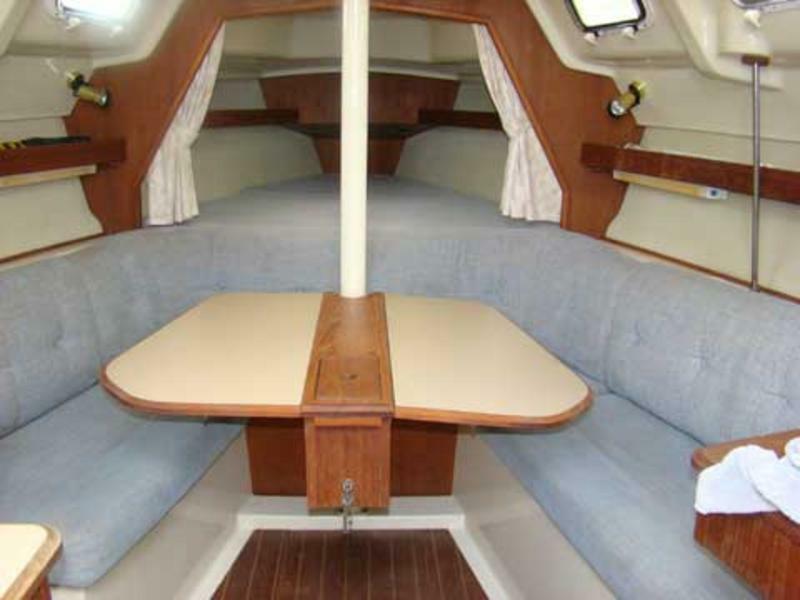 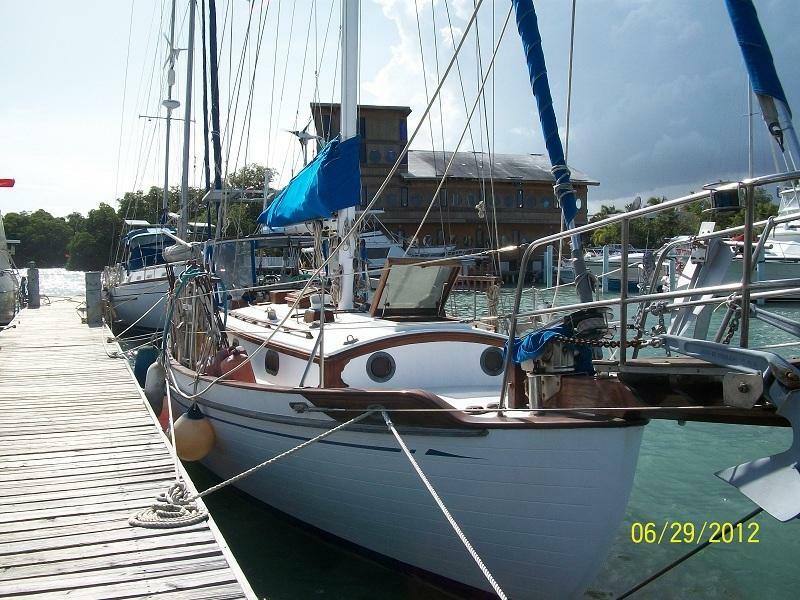 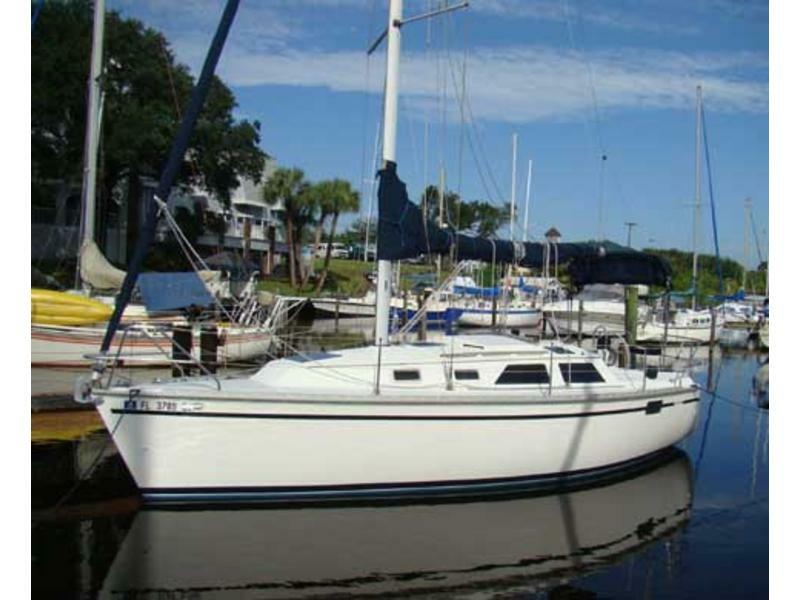 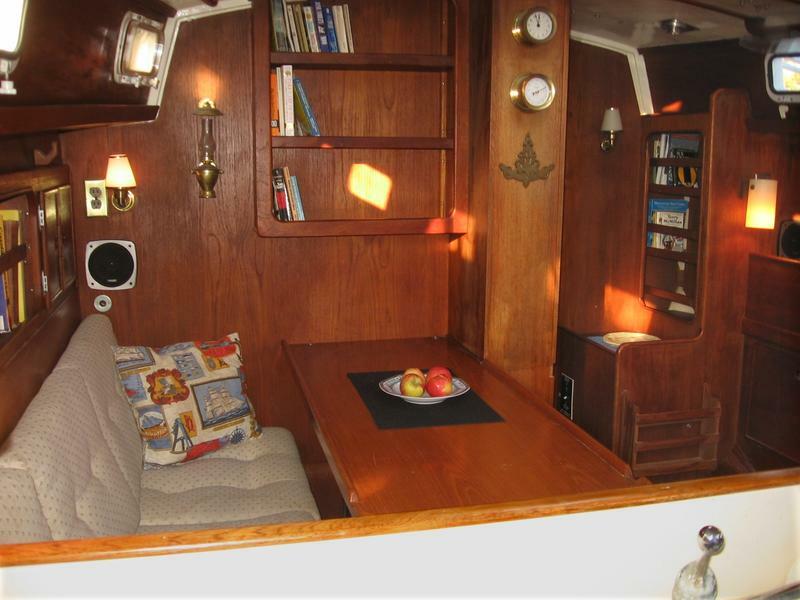 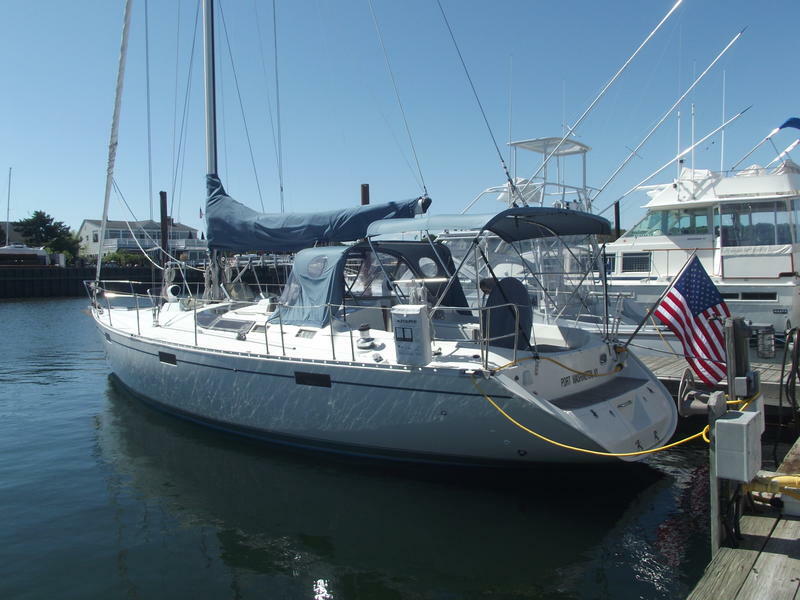 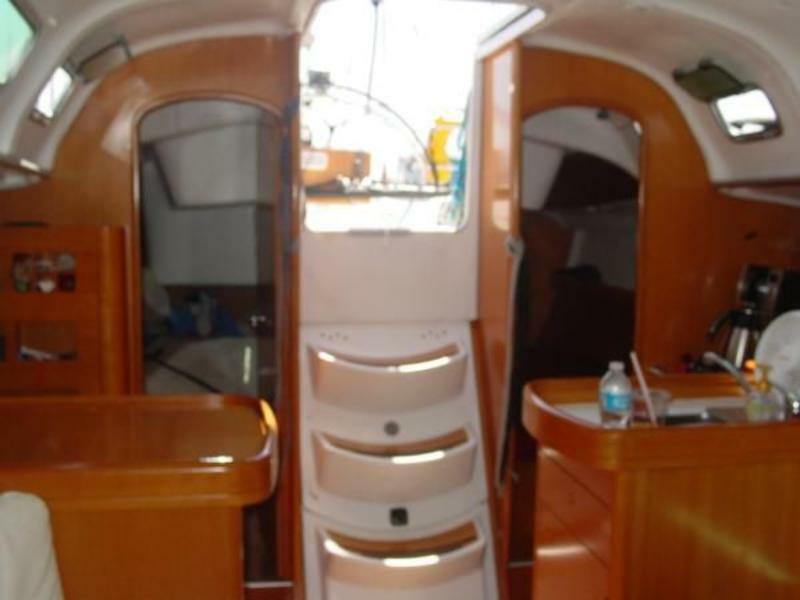 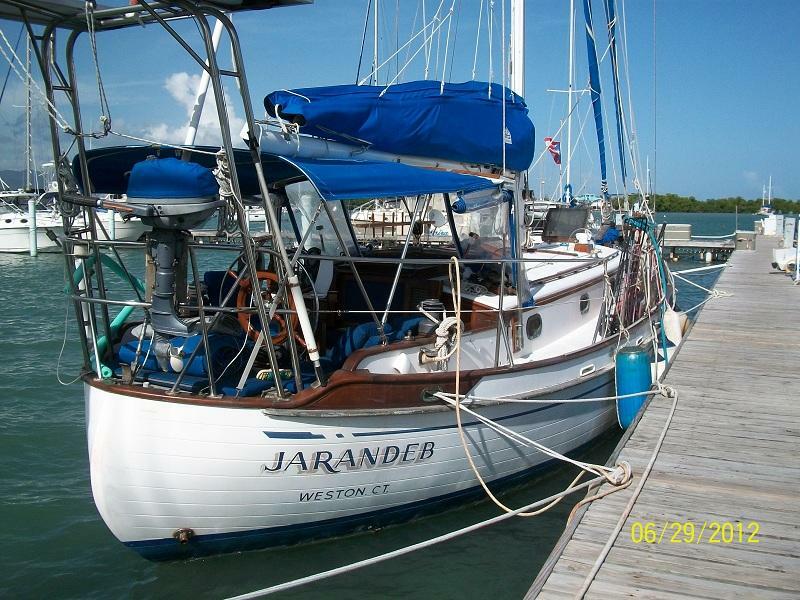 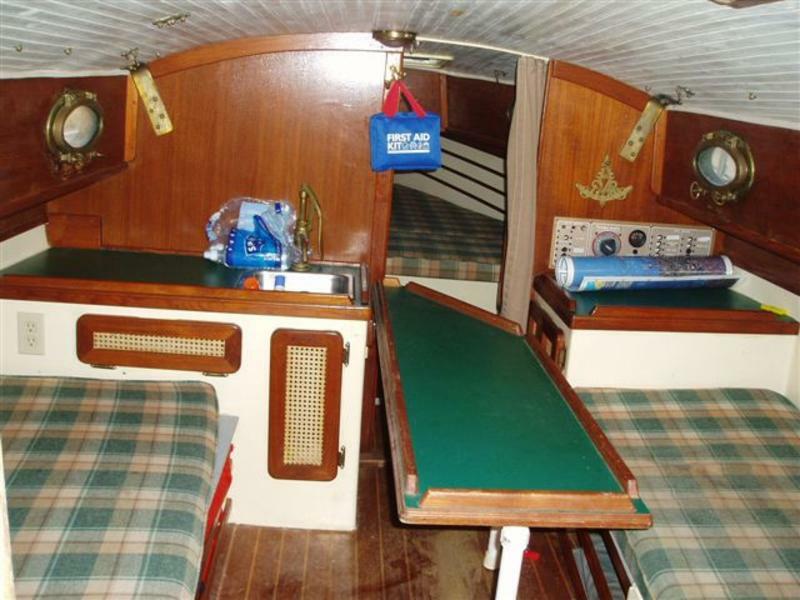 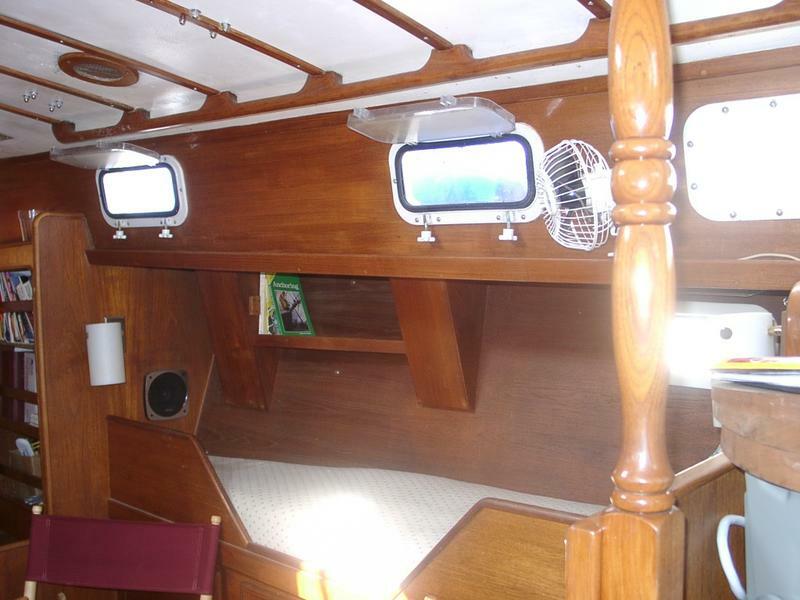 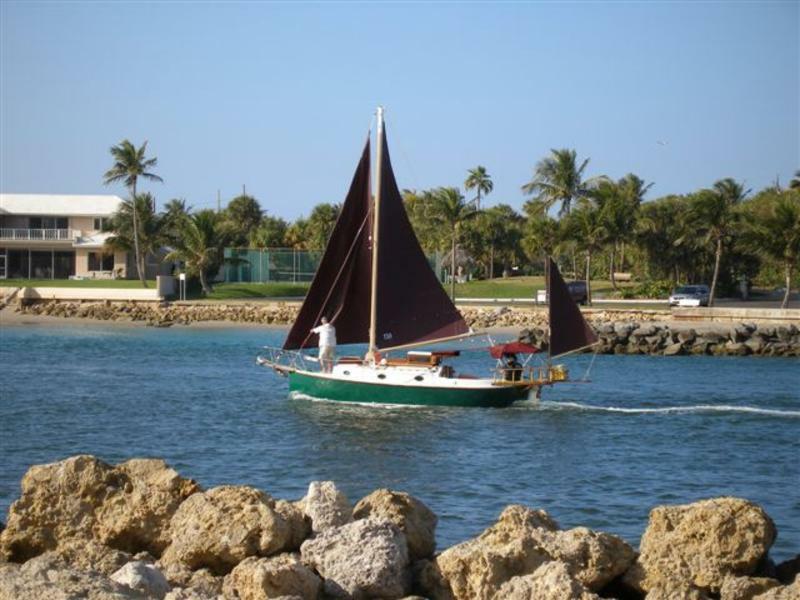 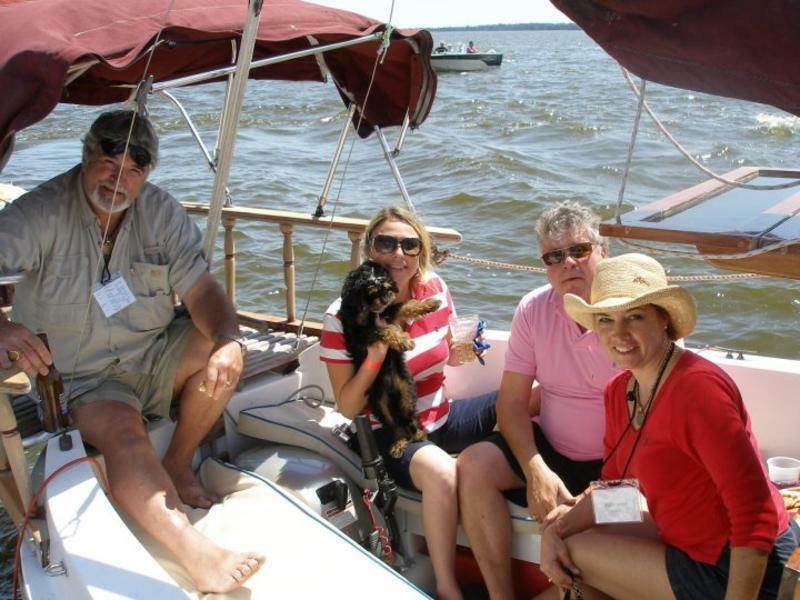 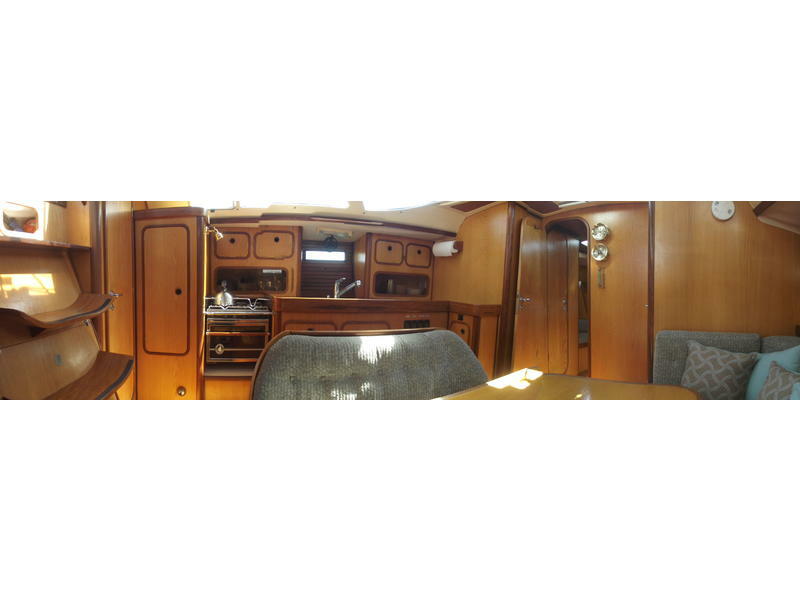 This one owner yacht has been well cared for and has always been freshwater kept. 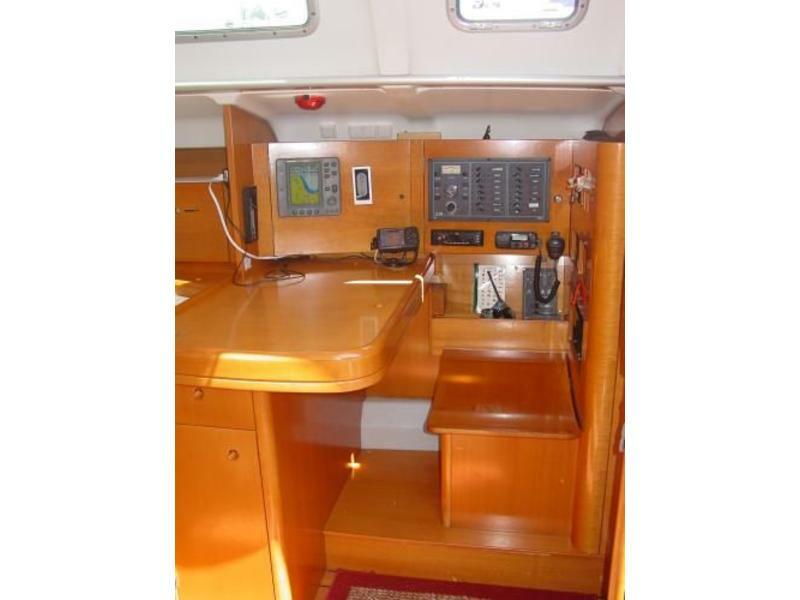 Electronics include: VHF radio with RAM mic,wind/depth/speed, GPS receiver chartplotter, White-Durepox (epoxy) bottom paint.